WASHINGTON DC / MEXICO CITY – January 9, 2015 – Rock ’n’ Roll DC Marathon & 1/2 Marathon Presented by Carefirst BlueCross BlueShield along with the inaugural Rock ‘n’ Roll Mexico City Half Marathon today announced a special opportunity for participants to run two capital city races in two countries over the weekend of March 14 & 15. 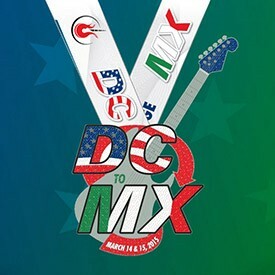 By completing two races in two countries in one weekend, participants will earn an exclusive #DC2MX medal, a unique vanity race bib, a gift bag, dedicated meet & mingle events in DC and Mexico City, race day transportation to and from host hotel in Mexico City, along with additional hospitality in Mexico City. Numerous direct flights from Washington DC to Mexico City depart Saturday afternoon or early Sunday morning, in time to arrive for the race. In 2013, nearly 80 ambitious traveling runners took advantage of the #SA2LV challenge, running the Rock ‘n’ Roll San Antonio Marathon or Half Marathon on the morning of Nov. 17, 2013, hopping on a plane and racing again at the Rock ‘n’ Roll Las Vegas Marathon or Half Marathon that evening. The Rock ‘n’ Roll Marathon Series birthed the challenge when the two races fell on the same day that year, creating both a running and logistical endurance challenge, with most runners grabbing one of only two flights to Sin City after running in San Antonio. Rock ‘n’ Roll DC takes runners on a tour of America’s most iconic landmarks. The race starts on Constitution Avenue at 14th Street, and will pass the White House and the stunning Washington Monument as they head toward George Washington University. The course then loops back towards the National Mall and Lincoln Memorial, passing West Potomac Park and crossing the Arlington Memorial Bridge. The event concludes with a finish line celebration and headliner concert at RFK Stadium. One of the world’s great capitals, Mexico City is the largest city in North America. It’s cultural mix of ancient Aztec temples, modern-art museums and extraordinary food culture promises an exhilarating event destination. The inaugural Rock ‘n’ Roll Mexico City Half Marathon will start and finish at Hipódromo de las Américas, while showcasing the city’s green parks, historic landmarks, fashionable shopping districts and vibrant neighborhoods. Rock ‘n’ Roll DC Marathon & ½ Marathon and Rock ‘n’ Roll Mexico City Half Marathon are part of a worldwide series of 29 musically themed marathons and half-marathons, uniquely combining entertainment and running into a running block party. The events will feature live bands positioned on entertainment stages along every mile of the scenic courses. The running festival experience is topped off with a finish line concert featuring a major headline act. Organized by Competitor Group, the Rock ‘n’ Roll Marathon Series is the ‘World’s Largest Running Series’ with more than 600,000 runners taking part in events around the world every year. Started in 1998, the simple idea of making running fun has transformed the U.S. running landscape by infusing the course with live bands, cheer teams and entertaining water stations, creating a block-party atmosphere for participants and spectators alike. Today, the series of marathons and half-marathons has spread to more than 29 destinations, drawing visitors from around the world. Race weekend kicks off with a free Health & Fitness Expo showcasing the latest in running gear, sports apparel, health and nutritional information and much more. Events culminate with an entertaining finish line festival featuring some of the biggest names in music, with headliners like Macklemore & Ryan Lewis, Aloe Blacc, Pitbull, FloRida, and Bret Michaels. For more information, please visit RunRocknRoll.com or follow @RunRocknRoll on Twitter.